The Korean War (1950-1953) was the first - and only - full-scale air war in the jet age. It was in the skies of North Korea where Soviet and American pilots came together in fierce aerial clashes. The best pilots of the opposing systems, the most powerful air forces, and the most up-to-date aircraft in the world in this period of history came together in pitched air battles. The analysis of the air war showed that the powerful United States Air Force and its allies were unable to achieve complete superiority in the air and were unable to fulfill all the tasks they'd been given. Soviet pilots and Soviet jet fighters, which were in no way inferior to their opponents and in certain respects were even superior to them, was the reason for this. The combat experience and new tactical aerial combat tactics, which were tested for the first time in the skies of Korea, have been eagerly studied and applied by modern air forces around the world today. This book fully discusses the Soviet participation in the Korean War and presents a view of this war from the opposite side, which is still not well known in the West from the multitude of publications by Western historians. The reason for this, of course, is the fact that Soviet records pertaining to the Korean War were for a long time highly classified, since Soviet air units were fighting in the skies of North Korea "incognito", so to speak or even more so to write about this was strictly forbidden in the Soviet Union right up to its ultimate collapse. The given work is in essence the first major work in the post-Soviet era. First published in a small edition in Russian in 1998, it was republished in Russia in 2007. For the first time, the Western reader can become acquainted with the most detailed and informative work existing on the course of the air war from the Soviet side, now in English language. The work rests primarily on the recollections of veterans of this war on the so-called 'Red' side - Soviet fighter pilots, who took direct part in this war on the side of North Korea. Their stories have been supplemented with an enormous amount of archival documents, as well as the work of Western historians. 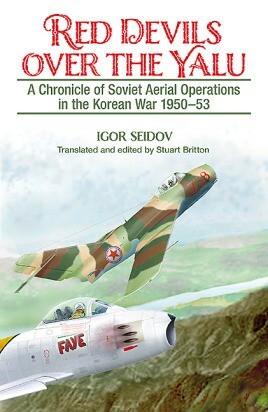 The author presents a literal day-by-day chronicle of the aerial combats and combat work of Soviet fighter regiments in the period between 1950 and 1953, and dedicates this work to all the men on both sides who fought and died in the Korean air war. Stuart Britton is a freelance translator who resides in Cedar Rapids, IA. He is responsible for a growing number of translated Russian military memoirs, battle histories and operational studies, which saw an explosion in Russia with the opening of secret military archives and the emergence of new Russian scholars who take a more objective look at the events and historical figures. Two works that received prizes or prominent acclaim were Valeriy Zamulin’s Demolishing a Myth: The Tank Battle at Prokhorovka, Kursk 1943 and Lev Lopukhovsky’s The Viaz’ma Catastrophe, 1941: The Red Army’s Disastrous Stand Against Operation Typhoon. Notable recent translations include Valeriy Zamulin’s The Battle of Kursk: Controversial and Neglected Aspects and Igor Sdvizhkov’s Confronting Case Blue:Briansk Front’s Attempt to Derail the German Drive to the Caucasus, July 1942. Future translated publications include Nikolai Ovcharenko’s analysis of the defense, occupation and liberation of Odessa, 1941-1944, and Zamulin’s detailed study of 7th Guards Army’s role and performance in the Battle of Kursk against Army Detachment Kempf. "… for those looking for a detailed … account of this important and understudied episode in Soviet military history, Seidov’s work will be indispensable"